Orthodontics it’s a very known subject in the dental area in compare to the orthopedics even though they are closely related and usually are used together, particularly with younger children, to set up a correct development in their teeth and mouth. While orthodontics guides the teeth into the correct position to ensure a proper bite and a healthy mouth, orthopedics is the guidance of facial growth and development. It’s about ensuring the jaws themselves are growing into the ideal position to prevent future issues. Together, they facilitate a healthy growth of the mouth and can prevent systemic or chronic problems in the future. Orthopedics is commonlly used on children because it’s easier to guide the growth of the jaw an adult. While it’s growing, than fix the jaw shape of Narrow jaws or underdeveloped jaws, especially the mandible or lower jaw are common areas for orthopedics to treat. An orthopedic work can begin from a very young age, in some cases around 5-6 years. But orthodontic treatment can’t begin until all of the permanent teeth have appeared, usually happens around ages from 10 to 13. In some cases pre-orthodontic appliances can be used to help guide the growth and development of the jaw and teeth. 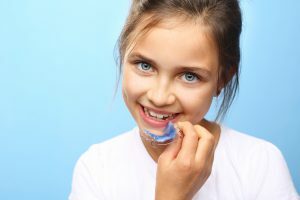 With the use of pre-orthodontic appliances, some children can avoid braces completely, or at least reduce the time of treatment when using them.